 Rabbit F(ab')2 anti Rat IgG antibody recognizes Rat IgG. Antisera to rat IgG were raised by repeated immunisation of rabbits with highly purified antigen. Purified IgG was prepared from whole serum by affinity chromatography. O-Charoenrat, P. et al. (2000) Epidermal growth factor-like ligands differentially up-regulate matrix metalloproteinase 9 in head and neck squamous carcinoma cells. Cancer Res. 60: 1121 - 1128. Leposavić, G. et al. (2010) Age-associated plasticity of α1-adrenoceptor-mediated tuning of T-cell development. Exp Gerontol. 45 (12): 918-35. Tiwari, S. (2011) Divalent cations regulate the folding and activation status of integrins during their intracellular trafficking. J Cell Sci. 124: 1672-80. Reynolds, J. et al. (2012) Stimulation of the PD-1/PDL-1 T-cell co-inhibitory pathway is effective in treatment of experimental autoimmune glomerulonephritis. Nephrol Dial Transplant. 27 (4): 1343-50. Villiers, E. et al. (2006) Identification of acute myeloid leukemia in dogs using flow cytometry with myeloperoxidase, MAC387, and a canine neutrophil-specific antibody. Vet Clin Pathol. 35 (1): 55-71. J of Equine Vet Sci. 33 (11): 969-976. Willheim, M. et al. (1999) Regulatory effects of 1alpha,25-dihydroxyvitamin D3 on the cytokine production of human peripheral blood lymphocytes. J Clin Endocrinol Metab. 84 (10): 3739-44. Thien, R. et al. (2005) Interactions of 1 alpha,25-dihydroxyvitamin D3 with IL-12 and IL-4 on cytokine expression of human T lymphocytes. J Allergy Clin Immunol. 116 (3): 683-9. Cian, F. et al. (2014) Stability of immunophenotypic lymphoid markers in fixed canine peripheral blood for flow cytometric analysis. Vet Clin Pathol. 43 (1): 101-8. Ferreira-Dias G et al. (2005) Seasonal reproduction in the mare: possible role of plasma leptin, body weight and immune status. Domest Anim Endocrinol. 29 (1): 203-13. Liu, W. et al. (2015) Evaluation of Stem Cell Marker Expression in Canine B-Cell Lymphoma Cell Lines, B-Cell Lymphoma-generated Spheres and Primary Samples. Anticancer Res. 35 (5): 2805-16. Vet Immunol Immunopathol. 135 (3-4): 275-81. Van de Velde, H. et al. (2012) Short-term increase of body weight triggers immunological variables in dogs. Vet Immunol Immunopathol. 145 (1-2): 431-7. Agrícola R et al. (2008) Blood lymphocyte subpopulations, neutrophil phagocytosis and proteinogram during late pregnancy and postpartum in mares. Reprod Domest Anim. 43 (2): 212-7.